Chemical Constituents and Components : Main chemical constituents are tartaric acid, citric acid, phosphoric acid, two polyisoprenylated derivatives, camboginol and camdogin. Hydroxycitric acid: 1. It inhibits the accumulation of fat as a result of consumption of carbohydrates and sugar. 2. It activates the process of thermogenesis. 3. It neutralizes the function of the enzyme ATP citrate lyase, thus lowers the fat and cholesterol accumulation. 4. It increases serotonin level (a neurotransmitter) and reduces the appetite. 5. It inhibits the lipid and fatty acid synthesis and lowers the synthesis of triglyserides and LDL. 6. It promotes the glycogen storage in liver and muscles. Curing Diseases : 1. It is helpful in weight loss and in obesity. 2. 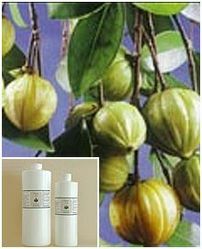 It is helpful in rheumatism, edema and intestinal parasites. 3. It is helpful in delayed menstruation. 4. It is useful in bowel complaints and acidity. 5. It possesses good amount of Vitamin C and act as cardiac tonic.